At The Transaction Group (TTG) we are proud to be the credit card processing choice of many merchants, including hardware stores and home improvement centers throughout America. Perhaps it’s our low rates and fast approval. Or maybe it’s the attention we give to each of our potential merchants. You know the saying carpenters use, “measure twice, cut once”. It’s all about getting it right from the start and not wasting time and money. That’s what we’re about at TTG. We take the time to understand the specific needs of your hardware store and build a solution to fit your requirements. With a TTG merchant account solution, not only will you enjoy simplified bookkeeping and accounting, you’ll have more control over your inventory. That’s right! In addition to offering your customers the convenience that credit card processing delivers, tracking and reordering supplies for your hardware or home improvement store is made easy! At TTG, we assist all businesses with merchant account services, regardless of their size or monthly volume. 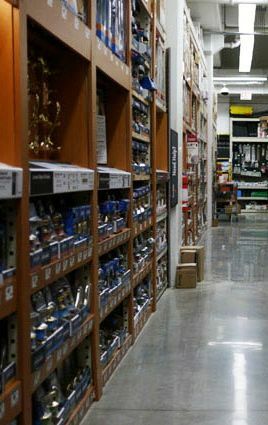 Whether you operate a small, local hardware store on Main Street, USA, or a large chain home improvement center, we can help! Already have credit card processing capabilities at your store and shopping for a better rate? Size us up against your current processor by taking advantage of our FREE RATE ANALYSIS. We may be able to save you as much as twenty percent! Email a recent statement to sales@thetransactiongroup.net or fax it to 312-896-5628. We will follow up with you very promptly with a detailed report. Get started today by clicking ‘Apply Now’. If you prefer to speak with us directly, call us! We look forward to assisting you!